Last time, we looked at the design and construction of a set of dining chairs which I had been commissioned to produce in a modest and understated way. 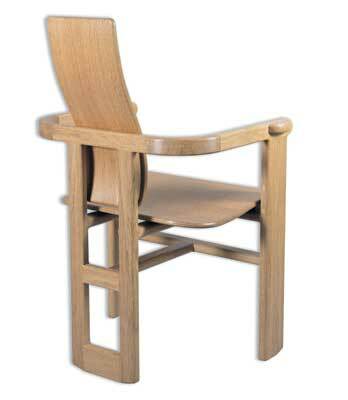 The frames for the chairs were made from French oak (Quercus spp). The components were marked out and cutting began. The side legs presented a problem. 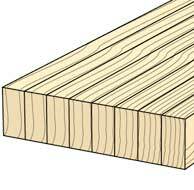 The dimension of the cross section was 90mm (3 1/2in) wide and 25mm (1in) thick. It was not possible to resaw the planks in half to obtain two 25mm thick sections due to the material lost in sawing and planing. 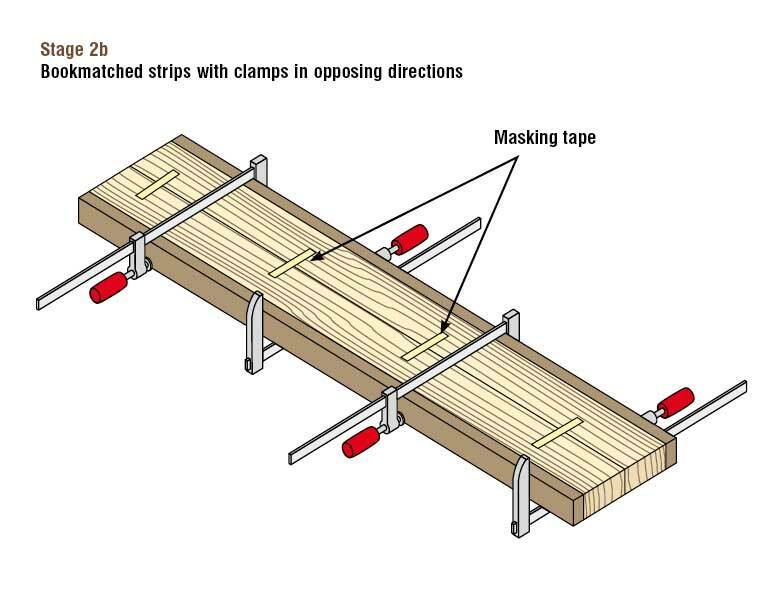 I decided instead to saw successive strips and glue pairs together to obtain the width. Although this took time, it gave me control over the visual continuity of the grain and economic use of the material that I had available. My Hitachi resaw, with its 75mm (3in) wide Stellite tipped blade produces a very clean cut, so I was able to glue the strips together and plane the final dimension to thickness after the glue had set. Surface alignment of the strips was achieved with masking tape and pressure applied with sash cramps. I had to glue up enough strips to produce sixteen side legs. 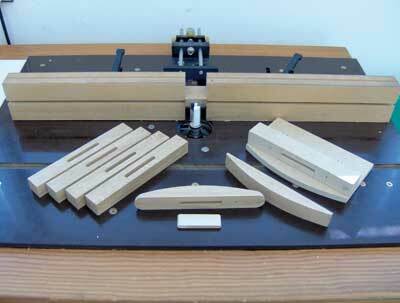 With Titebond III, I was able to get a sequence going that enabled me to glue up four pairs in succession. Titebond III is pressure sensitive and cramps can be removed after 15 minutes as long as the joint is not subjected to excessive strain until the adhesive has cured. I glued up all sixteen side legs in succession and did not have to spend any extra time waiting for the glue to dry. Together with accurate parallel faces and edges, the sliding table of my dimension saw gave me all the reference surfaces necessary with which to cut the mortise and tenon joints that made up the main frames. 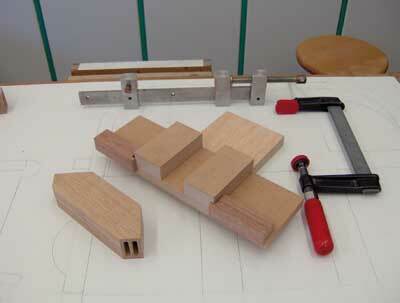 I decided to use twin tenons for all the mortise and tenon joints. Knowing that the atmosphere of the room in which the chairs would be used was very dry, the increase in surface area of glue contact would go a long way to improve the strength. I could also reduce the length of the tenons so that any shrinkage of the mortise components would be less likely to cause failure at the shoulders. 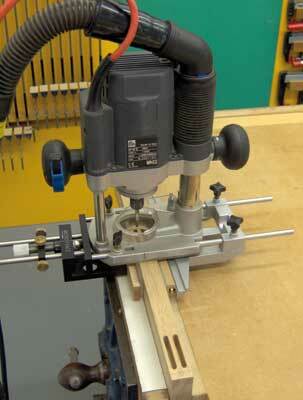 My milling machine plays a major part in the precise cutting of many woodworking joints. The fact that the three axes of movement can be zeroed and controlled to an accuracy of .05mm enables me to get the optimum fit between contacting surfaces of joints. To hold the tenon components in place, I use a base board which has reference fences to ensure that components are positioned with repeatable control. 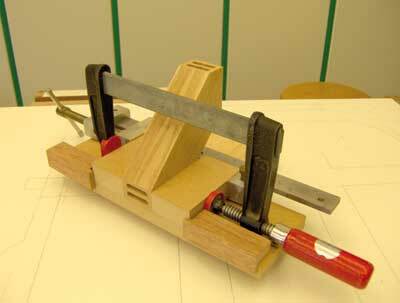 To counteract the force of the cutter, toggle and cam clamps are fitted to the base board. I used a 25mm (1in) parallel bit with a good end cut to skim the outer faces of the tenons. In the past, I used to set the traverse of the cutter to leave a small amount of material which could then be pared away to leave a crisp edge to the shoulders. 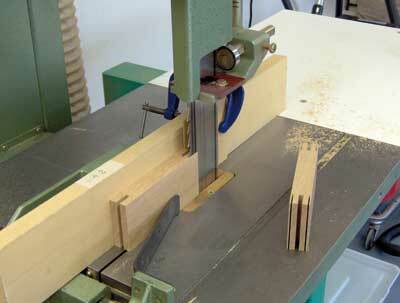 This was a process that was necessary when I cut mortise and tenon joints by hand. 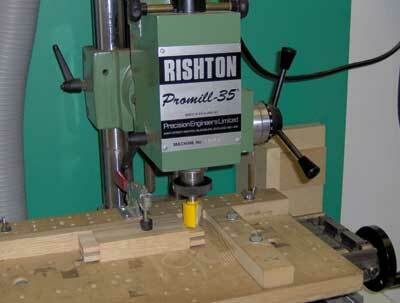 With the fine control of the milling machine, I was able to set the cutter so that it went right up to the gauge line of the shoulder, thus eliminating another time consuming process. When all the outer faces had been skimmed, I replaced the base board with a machine vice so that I could skim the top and bottom shoulders of the twin tenons. I fixed a plastic stop onto the outside face of the vice jaws with a G-cramp to align with the previously machined shoulders. I cut the mortises with a router fitted with a MicroFence. I mentioned earlier that the tenons were slightly thicker than the 1/4in router cutter that I had chosen. They were in fact 7mm (9/32in) thick. I set the MicroFence to the inner face of the mortises using the gauge lines that I marked out earlier. 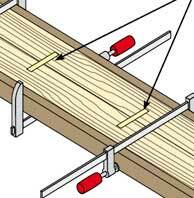 When cutting mortises with an overhead hand-held router, it is difficult to control the plunge action due to the narrow surface of contact with the base. I employ an additional fence which is mounted on the projecting rods such that the component is trapped between the two fences, thus eliminating any risk of movement sideways. 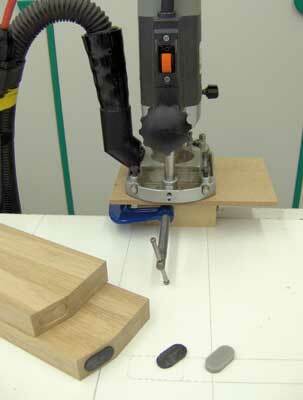 With this router setting, I removed the bulk of the material from all the mortises. The precise control of the MicroFence was then employed to remove the rest of the material from the mortises. I measured the distance between the outer faces of the tenons with my dial calipers. This was followed by the measurement between the outer faces of the mortises. The difference was halved and the MicroFence dial was adjusted to this figure before the rest of the material was routed away. The only problem with routing a mortise slot is the need to square up the ends before the joint can be assembled. 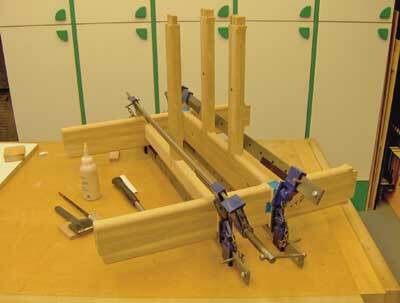 Rounding the edges of the tenons is a complex option requiring quite sophisticated jigs. In practice, it is easier to achieve the result by paring back to the end lines with a chisel. To speed up the process, I made a very simple jig, which although it could only be used to pare the ends that formed the inner corner of the assembled joint, the time saved was worth it. The opposite ends had to be pared freehand. 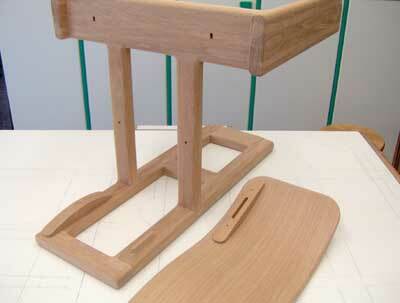 The final stage in the making of the joints for the chair frames involved the rounded back corners of the arms. I decided to make the curved corner from solid wood. 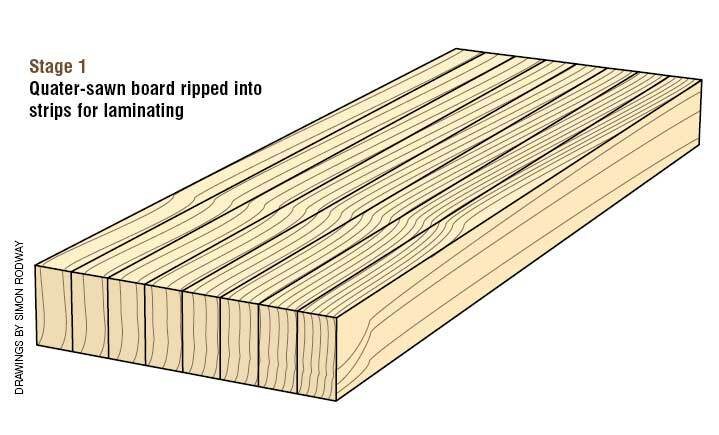 The junction between the block and the arms was in effect a mitre, which was easily cut with the crosscut fence set at 45 degrees on the sliding table. I used loose tenons to form the connections and the receiving slots were cut with a router and a jig. 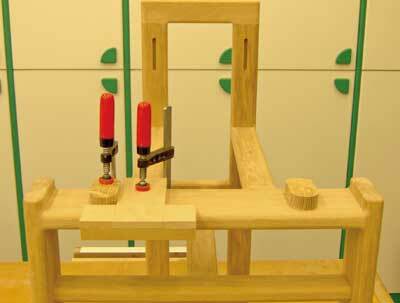 This jig had to provide control over the width of the slots and their distance, and alignment from the outer edge of the arms, back rail and corner blocks. This was achieved with stop blocks and the router fence. The outer corners of these blocks were left square so that they could be used to distribute pressure from the sash cramps during assembly. The inner curves were cut on the bandsaw and cleaned up on my bobbin sander before they were glued in place. After cutting the joints, I was able to do an initial dry assembly. Although I knew how the construction would go together, I found it very useful to assemble the frames so that I could assure myself that the sequence would eliminate any problems that might occur when glue was applied to the joints. I also found it quite exciting seeing the components together for the first time. 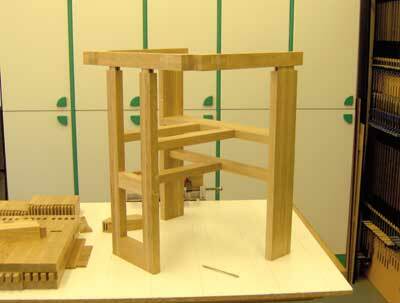 I examined the dry assembled construction to ascertain which processes would be difficult to carry out after gluing up. The seat, although it was laminated and bonded together with epoxy resin, was made up of layers of constructional veneer with the grain running in one direction. This meant that it could expand and contract, so the method of fixing had to compensate for the movement. 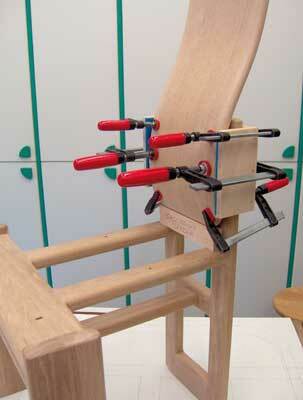 The seat was held in place with screws which were fixed at the back and slotted at the front. Once again, my milling machine came to the rescue. 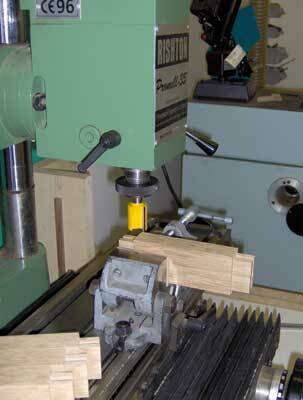 The slot was cut with a 5mm (3/16in) diameter spiral flute cutter and then countersunk with a chamfer cutter. One setting for the forward and back traverse enabled all the slots to be cut in progression and this was followed with the same setting for the countersunk slots. This was another process that was done before gluing up. 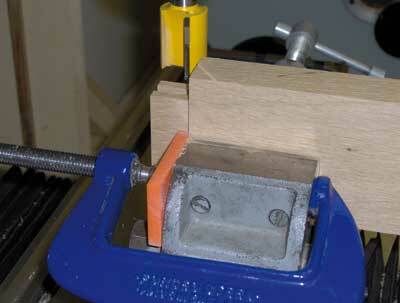 A simple jig which employed a guide bush was used to cut the slots with a hand-held router. The backs were glued in place with a profiled insert which follows the inner curve of the laminated form and connects with the upright extensions of the back legs with a loose tongue. The slots to accept the tongues were routed before the frame was glued up. 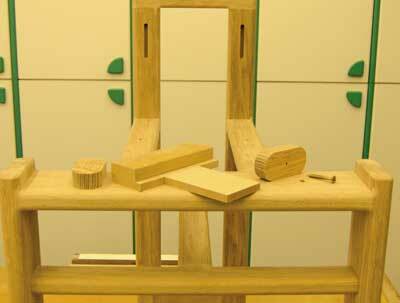 The back corners of the arms for the carver chair were left square to act as cramping blocks to enable the assembly to be glued up. The excess material was removed afterwards with a bandsaw and sanded to the finished profile on my disc sander. The final machining process before the frames could be glued together, was to rout any of the rounded edges that could not be accessed after assembly. This was done on my router table. All surfaces that would be difficult to get at after assembly, were sanded at this stage. 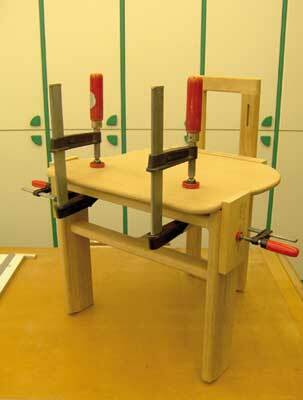 The stretcher rails, seat frames and back legs were glued up before their edges were rounded over. The next stage was to glue on the front legs and finally the back legs. 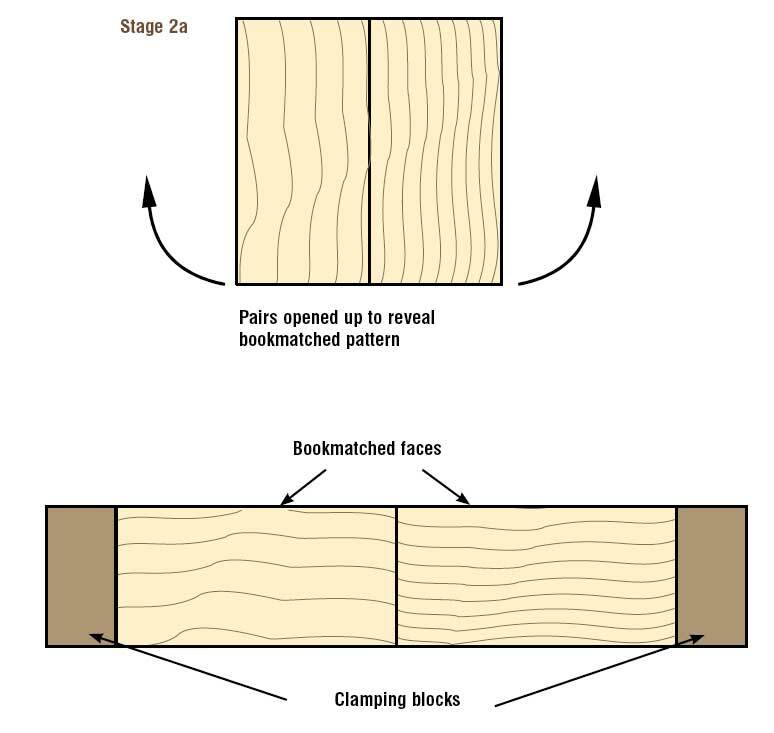 Cramping blocks were held in place with masking tape to make it simpler to position the sash cramps, thus reducing the mental stress experienced during assembly. The inserts to fix the seats and backs in position were then made using the router table, a ball race cutter and profiled jigs. The profile was transferred directly from the curves of the seats and backs, and formed on my disc sander. I used a scalpel instead of a pencil to mark the lines, as this gave me more definition when using the sander. The jigs were made large enough to give me sufficient grip on the router table. The inserts for the seats were quite small so they were held in place with a screw and two end blocks. These blocks also provided a smooth flow during the routing process. The screw hole doubled up with the fixing screw that held the seat in place. The inserts for the backs utilised the loose tongue slots and two additional screws ensured safety during the routing process. 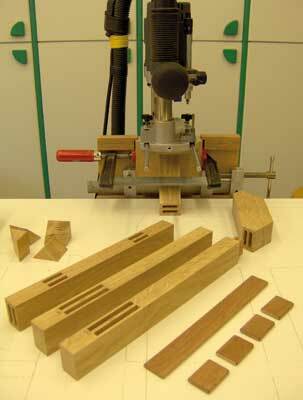 Before the profiles were routed, the excess material was removed with a bandsaw, cutting as close to the line as possible to limit the resistance from the router cutter. All the edges that could be rounded were done on the router table before assembly. However, where the profiles meet at corners, the flow had to be fared in after the construction had been assembled. This was done with a hand-held router. I find that the change in direction of the grain causes problems, both of breakout and scorching. To overcome this, I feed the router in the reverse direction to remove the bulk of the material and then move it forward to finish the cut. 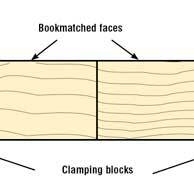 With practice, it is possible to minimise breakout and scorching, and the final smoothness can be achieved with a profiled sanding block. I use Trimite Fixit adhesive backed abrasive paper which as the name suggests, can be stuck on to a cork covered piece of MDF shaped to a suitable profile. The frames, seats and backs were sprayed separately so that I could denib and burnish the surfaces with ease of access to internal edges and corners. 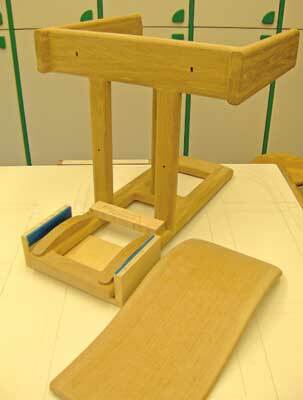 Once the components had been finished, the backs were glued in place with a jig that obviated the need for any marking out lines for positioning. Similarly, the seats were glued to the front blocks with positioning jigs to ensure continuity of accuracy and ease of assembly, after which they were held in place from under the frame with screws. "I find that the change in direction of the grain causes problems, both of breakout and scorching"